LOT 1 - Oriental chess set with games board. LOT 2 - Cased set of eight hallmarked silver tea spoons. LOT 3 - Art Deco lady's mesh handbag. LOT 4 - Lot of silver serving spoons and fork. LOT 5 - Two nephrite carvings of animals. LOT 6 - Two nephrite carved snake discs. LOT 7 - Two nephrite carved circular discs- Figures on Horses. LOT 8 - Ivory bracelet and brooch. LOT 9 - Hallmarked silver thimble. LOT 10 - Two small boxes of ivory jewelry. LOT 10A - Pair of china floral decorated vases with sterling mounts. LOT 11 - Six piece Canadian sterling silver condiment set- O.B.Allan & Ryrie. LOT 12 - Two beaded necklaces. LOT 13 - AE & Co Marca Registrada sheathed gaucho knife, 12 1/2". LOT 14 - Collection of sewing items and two porcelain figurines. LOT 15 - Circular nephrite carved disc of a kneeling figure with container. LOT 16 - Nephrite carved disc of two entwined fish. LOT 17 - Nephrite carved circular disc of a dragon. LOT 18 - Circular carved nephrite figure of a Goddess. LOT 19 - Ivory pendant on chain. LOT 20 - Three ivory beaded necklaces. LOT 21 - 18th century engraving of Apostles in wooden case. LOT 22 - Cased set of six silver handled butter spreaders. LOT 23 - Oil on canvas signed J. (Jack) Hardcastle, 25 1/2" x 41 1/2", "Tall Ship at Sea". LOT 24 - Oil on canvas signed E.B. De Angels, "Market Day". LOT 25 - Oil painting on panel, signed G. Klevet, "Pastoral Scene". LOT 26 - Two vols. The North-West Mounted Police by John Peter Turner-Ottawa 1950. LOT 27 - Edwardian carved walnut window bench. LOT 28 - Victorian mahogany Sutherland table. LOT 29 - Bokhara carpet, approx. 12' x 9'8". LOT 30 - Four prints/etchings, "Cries of London". LOT 30A - Piano stool with glass ball and claw feet. LOT 31 - Lot of pewter and a pair of plated candlesticks. LOT 32 - Marble topped mahogany washstand. LOT 33 - Oil on canvas signed A. Leblanc, 20" x 16", "Rue St. Louis, Quebec". LOT 34 - Oil on board signed Yeats, 10"x 12", "Westcoast Landscape". LOT 35 - Pair of oil paintings on canvas, 7 x 9, "Highland Scenes". LOT 36 - "Contessa" antique armchair. LOT 37 - Geo J Flannigan Chicago book stand. LOT 38 - Brass wood box with contents. LOT 39 - Oil on canvas signed (Arthur) Horsfall dated '46", 22 1/2" x 17 1/2", "Man's Face". LOT 40 - Oil on board signed A.Horsfall d. '57, 15 1/2" x 19 1/2", "Untitled- Still Life". LOT 41 - William Hogarth engraving, 17" x 22", "An Election Entertainment". LOT 42 - Oil on canvas signed(Luigi) Anelli, dated '72, 21" x 16", "Portrait of a Man". LOT 43 - Oil on canvas signed(Luigi) Anelli, 24" x 12", "Hands". LOT 44 - Victorian balloon-backed side chair. LOT 45 - 19th. century silver plated teapot. LOT 46 - Bohemian floral painted cranberry and white coloured vase. LOT 47 - Signed Chinese hand-painted porcelain fish vase. LOT 48 - Milk glass covered fish dish. LOT 49 - Early Singer hand crank sewing machine. LOT 50 - Small lot of early tea cups and saucers. LOT 51 - Carved serpentine horses with stand. LOT 52 - Sewing cabinet with barley twist legs. LOT 53 - Carved open armchair with tapestry upholstered back and seat. LOT 54 - Red crayon drawing & charcoal drawing-both signed Bruno Bobak one dated 1961,"Man & Woman". LOT 55 - Late 19th century mantle clock. LOT 56 - Lot of antique and vintage glass stoppers. LOT 57 - Walnut bow front display cabinet. LOT 58 - Watercolour signed Stephanie Quainton Steel, 14" x 20", "West Coast Landscape". LOT 59 - Coloured lithograph of a Gentleman on horseback. LOT 60 - Victorian mahogany side chair. LOT 61 - Two fold mat framed fire guard. LOT 62 - Victorian brass companion set. LOT 63 - Victorian mahogany side chair. LOT 64 - Small Asian flat weave rug. LOT 65 - Oil on canvas signed Art Horsfall Jr, 15" x 13 3/4", "Portrait of a Lady". LOT 66 - Oil on canvas signed (Arthur) Horsfall, 16" x 20", "Contrast 1945". LOT 67 - Victorian marble mantle clock. LOT 68 - 19th. century mahogany beaded tray. LOT 69 - Mahogany campaign chest(top part). LOT 70 - Copper coal hod and scoop. LOT 71 - Armand Marseilles Bisque headed doll. LOT 72 - Victorian green button backed upholstered rocking chair. LOT 73 - Asian square shaped rug. LOT 74 - Oil on canvas signed P.S. Kougaard, 25 3/4" x 27", "Boats at Bay". LOT 75 - Ltd.ed.engraving signed K. Haring numbered 66/90. LOT 76 - Lot of crystal including a Waterford pitcher. LOT 77 - Oak washstand with backboard. LOT 78 - Victorian mahogany side chair. LOT 79 - 19th Century violin with two bows in case- paper label. LOT 80 - Violin signed Farre with case. LOT 81 - Antique hand-stitched quilt. LOT 82 - Victorian mahogany side chair. LOT 83 - Canadian officer's dress uniform jacket and pants. LOT 84 - Oak pedestal table with two leaves. LOT 85 - Painted spinning wheel dated 1917- family owned. LOT 86 - Set of four carved walnut dining chairs. LOT 87 - Navajo crystal trading post double saddle blanket, 60" x 25". LOT 88 - Asian carpet. LOT 89 - Persian runner, 3'7" x 10'. 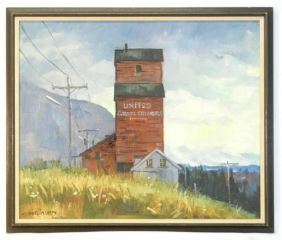 LOT 90 - Oil on board illegibly signed and dated '57, 15" x 20", "Laurentian Scene". LOT 91 - Victorian mahogany side chair. LOT 92 - Oil painting on canvas unsigned, "Coastal Scene with fishing boats". LOT 93 - Oil painting on board, "Coastal Scene". LOT 94 - Victorian carved mahogany side chair. LOT 95 - Small lot of Victorian china plates. LOT 96 - Victorian marble mantle clock. LOT 97 - Two crystal decanters and crystal glasses. LOT 98 - Late 19th.century walnut mirrored back cabinet. LOT 99 - 19th. century unsigned oil on canvas, 23" x 19", "Roman Ruins". LOT 100 - Painting on porcelain signed "Geese Drinking". LOT 101 - Two engravings- Lord Nelson and London Times paper-death of Nelson. LOT 102 - Mary McGregor green glass jug and two tumblers, pink vase. LOT 103 - Two Charles Dickens books- Bleak House and Nicholas Nickleby. LOT 104 - Quimper platter and two plates. LOT 105 - Lot of matching 19th century Worcester china. LOT 106 - Watercolour signed possibly G.W. Roshworth 1900, 15" x 21", "St.Paul -King St."
LOT 107 - Watercolour by Arthur Cheekley, "Rocky Mountain Lake". LOT 108 - Oil on canvas possibly signed Paris, 23 1/2" x 27", "Untitled". LOT 109 - Oil on canvas signed N. Drummond, 18" x 30", "Moose beside River". LOT 110 - Pair of Blue and white china vases and tea caddies. LOT 111 - Late 19th. century maple dressing cabinet. LOT 112 - Antique watercolour signed A.S. Cripps, "Coastal Scene". LOT 113 - Pr.of 19th. cen. oval framed w/c's, 23" x 19", "Portrait of a Lady and Gentleman". LOT 114 - Small gilt frame Baxter style print. LOT 115 - Oil on board signed R.(Rose) Bullen d.1936, 9 1/2" x 6 1/2", "Coastal Landscape". LOT 116 - Lot of misc. serving pieces. LOT 117 - Apprentice's kitchen cabinet, 31". LOT 118 - Pine chest of four drawers with porcelain pulls. LOT 119 - Pine chest of three drawers with porcelain pulls. LOT 120 - Antique Chinese framed embroidery. LOT 121 - Victorian mahogany side chair. LOT 122 - Pair of chairs stamped Lincoln Cathedral. LOT 123 - Continental repousse decorated pierced oval shaped bowl. LOT 124 - Old Chinese lacquer ware collection. LOT 125 - 19th. century country made kitchen table. LOT 126 - Oil on lacquered paper machete "Jersey Channel Isle". LOT 127 - Navajo rug. LOT 128 - Pair of Victorian blue upholstered side chairs. LOT 129 - Chinese fine embroidery bag. LOT 130 - Chinese embroidered jacket and pants. LOT 131 - Asian blue patterned carpet, approx. 8'6" x 11'6". LOT 132 - Pair of Windsor style side chairs. LOT 133 - Blue and white Willow pattern platter. LOT 134 - Pair of Staffordshire figured deer. LOT 135 - Three Victorian brass fire side tools. LOT 136 - Carved walnut mirrored backed hall stand. LOT 137 - Twelve inch Carlton Ware vase. LOT 138 - Oak fall front bureau. LOT 139 - Pair of Victorian carved mahogany burgundy upholstered side chairs. LOT 140 - Pine chest fitted with a lower drawer. LOT 141 - Set of four Quimper plates signed Henriot, 9 3/4". LOT 142 - Lot of Waterford glassware. LOT 143 - Ten decorative Chinese dishes with peaches. LOT 144 - Oak draw leaf dining room table. LOT 145 - Victorian mahogany side chair. LOT 146 - Set of three antique side chairs. LOT 147 - Set of four Victorian dining chairs and two similar matching uph. chairs. LOT 148 - 2 pencil drawings signed Laura Knight, "Circus Elephants". LOT 149 - Lot of Victorian blue and white transfer printed china. LOT 150 - 19th. century oak drop leaf gate leg dining room table. LOT 151 - Two pair of Victorian brass andirons. LOT 153 - Victorian mahogany cased pocket thermometer. LOT 154 - Two Japanese bronze vases. LOT 155 - Small box with silver seal, ornamental scissors, etc. LOT 156 - Circular carved and pierced nephrite disc. LOT 157 - Circular carved nephrite disc of a dragon. LOT 158 - Oriental carved nephrite entwinned pull. LOT 159 - 19th. century dirk with ivory handle, 13". LOT 160 - 19th century Chinese ginger jar, 5". LOT 161 - Large butter bowl. LOT 162 - Victorian mahogany hall table. LOT 163 - Asian carpet. LOT 164 - Anglo Indian carved oval table with folding base. LOT 165 - Pair of watercolours signed HF 1886, 10" x 14", "Country Scenes". LOT 166 - Victorian pink upholstered chair. LOT 168 - Victorian mahogany dresser mirror. LOT 169 - Victorian mahogany small kneehole desk. LOT 170 - Pair of early Victorian dining chairs. LOT 171 - Pair of oils on canvas signed J. Raun, 19 1/2" x 24", "Birds in Wooded Landscapes". LOT 172 - Pastel signed Christofferson, 6 1/2" x 5 1/2", "Native Girl". LOT 173 - Oil on canvas signed S.C.Bjulf, 11 1/2" x 19", "Danish Coastal Village Dock". LOT 174 - Crystal wine carafe with silver plated mounts. LOT 175 - Chinese foo dogs. LOT 176 - Mahogany chest of drawers. LOT 177 - Pair of botanical prints. LOT 178 - Oil on board signed Marie Livingstone, 19 1/2" x 23", "Untitled". LOT 179 - Oil on canvas "Dogs and Pheasant". LOT 180 - Two 19th. century botany books- Conversations on Botany(1817) and Maud's Botanic Garden. LOT 181 - 19th. carved mahogany high backed bureau-chest. LOT 182 - Asian carpet approximately 10" x 14". LOT 183 - 19th. century silver plated three bottle tantalus-bottle holder. LOT 184 - Victorian carved mahogany vanity. LOT 185 - Pair of carved mahogany carvers. LOT 186 - 19th. century Continental china painted two handled vase, 8 3/4". LOT 187 - Pair of Birks sterling silver candlesticks, 3" in height. LOT 188 - Victorian silver serving spoon. LOT 189 - Continental china bear figured inkwell. LOT 190 - Late 18th./early 19th. century cast metal miniature cannon barrel, 10". LOT 190A - Pocket watch in mahogany case - tested at Woolrich. LOT 190B - Three piece Birks sterling silver dresser set. LOT 191 - Short sword with brass handle and fitted scabbard. LOT 192 - Small Gurkha knife and a small Burmese dagger. LOT 193 - Three Staffordshire dogs. LOT 194 - Royal Doulton art pottery three handled and footed bowl, 4 3/4". LOT 195 - Oak drop leaf gate legged barley twist table. LOT 196 - Etching signed Sam Black, "Harmony" numb.16/50, 14 1/2" x 18". LOT 197 - Oil on canvas indistinctly signed, 36" x 24", "Child with Books-Pen and Ink". LOT 198 - Victorian walnut lap desk. LOT 199 - Signed Chinese hand-painted porcelain vase. LOT 200 - Inlaid mahogany music cabinet. LOT 201 - Watercolour signed Jack Wilkinson 22 1/2" x 15", "The Artist". LOT 202 - Two pair of brass candelsticks. LOT 203 - Silver plated four bottle cruet. LOT 204 - Late 19th. century maple dressing cabinet. LOT 205 - Rosewood cased dresser clock. LOT 206 - Victorian china part tea service. LOT 207 - 19th. century mahogany tilt top breakfast table. LOT 208 - Four Victorian dining chairs. LOT 209 - Asian rug. LOT 210 - Lithograph-Mark Chagall, 13 1/4" x 10 1/4", C.1960, "Job". LOT 211 - 19th century watercolour - Three Figures on Hilltop. LOT 212 - 19th. century inlaid walnut Davenport desk. LOT 213 - Victorian mahogany rope styled armchair. LOT 214 - Silk carpet with black field, approximately 5'2"x3'. LOT 215 - Victorian inlaid mahogany linen press. LOT 216 - Victorian brass two tier jardiniere stand with marble top. LOT 217 - Set of eight carved mahogany upholstered dining chairs (two needing repair). LOT 218 - Watercolour signed A. Edwards '80, 21" x 28", "Coastal Scene". LOT 219 - Antique brass mortal and pestle. LOT 220 - Pair of Chinese porcelain bowls, 7 3/8" diameter. LOT 221 - 2 pencil drawings signed Laura Knight, "Circus Performers"
LOT 222 - Antique converted linen press bookcase with glass doors. LOT 223 - Oil on board signed EG (Eric Goldberg), 20" x 24", "The Dance". LOT 224 - Birks sterling silver candlestick, 7". LOT 225 - Large two handled Quimper bowl, 14 1/2". LOT 226 - Brass carriage clock retailed in Victoria BC, 5 1/2" with handle. LOT 227 - Brass carriage clock, 5 3/4" with handle. LOT 228 - Jennings Brothers repousse decorated jewelry box marked JB, 5 1/4". LOT 229 - Fruit service for eighteen in a mahogany fitted case. LOT 230 - Oil on canvas signed Th.B.Dahl dated 1919, 16" x 20", "Danish Coastal Building-Hillerod". LOT 231 - Unsigned oil on canvas, 9 3/4" x 13 1/2", "Lake Fishing". LOT 232 - Victorian mahogany fire screen with needlework panel. LOT 233 - Continental Adolph Nathan stick barometer, 31". LOT 234 - Framed miniature silhouette of a Roman Man. LOT 235 - Oil on canvas signed Fritz-Stahr Olsen dated 1918, 16" x 27", "Danish Coastal Scene". LOT 236 - Japanese blue and white wall plate. LOT 237 - Framed map of Scotland by Robt. Morden, 18" x 14". LOT 238 - Oil on board signed Daniel Izzard, 20" x 24", "The Passing Rain". LOT 239 - Unsigned oil on board, 11 1/2" x 16 1/2", "Country with Horses". LOT 240 - Cut crystal decanter with silver "Brandy" lable. LOT 241 - Victorian walnut mantle clock. LOT 242 - Victorian cut crystal pitcher. LOT 243 - Victorian mahogany bow front chest of drawers. LOT 244 - Oil painting signed TS Gore, "Lake Scene". LOT 245 - Botanical "Augusta Innes Withers" signed (King George IV Peach) 1829. LOT 246 - Carved wood oriental wall carving. LOT 247 - Oil on board signed P.v.Zyl, 9" x 11", "Winter Landscape". LOT 248 - Victorian parquetry sewing box. LOT 249 - Victorian burr walnut side table. LOT 250 - Victorian brass fire fender. LOT 251 - Pair of Victorian brass andirons. LOT 252 - Victorian three piece brass companion set. LOT 253 - Victorian copper coal hod with scoop. LOT 254 - Brass four branch ceiling fixture. LOT 255 - Spinning wheel. LOT 256 - Three pieces of Victorian blue and white transfer printed china. LOT 257 - Champleve vase. LOT 258 - Pair of Victorian china cups and saucers. LOT 259 - Victorian mahogany Sutherland table. LOT 260 - Oriental brass and champleve bowl, measuring 9 1/2 inches in diameter. LOT 261 - Victorian walnut side table. LOT 262 - Persian rug, approx. 6' x 4'1". LOT 263 - Persian rug, approx. 4'10" x 3'1".